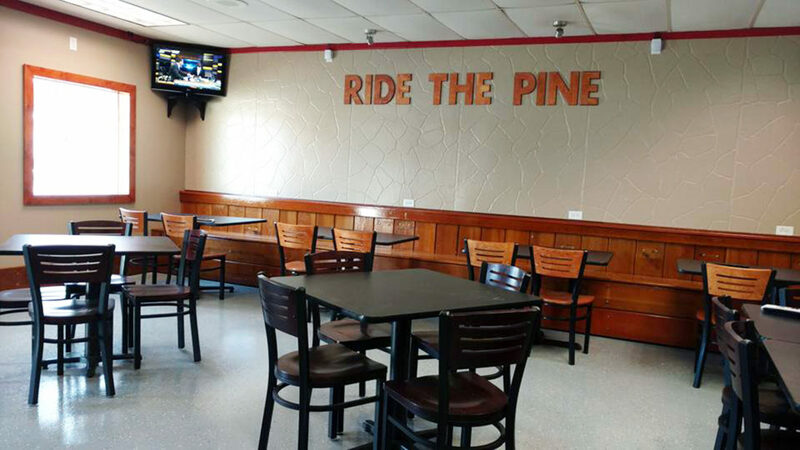 PHOTO SUBMITTED The back wall of Benchwarmers Restaurant and Delivery, 105 Allen St., features wooden bleachers with the restaurant’s slogan, “Ride the Pine,” on the wall above. A new dining option is to open Monday. Benchwarmers Restaurant and Delivery, located at 105 Allen St., will be open 11 a.m.-12:30 a.m. Sunday-Thursday and 11 a.m.-1:30 a.m. Friday and Saturday with dine-in closing at 10 p.m. most nights, unless an important sporting event is scheduled. Restaurant co-owners Brandyn Banks-Sherer and Jason Miller said they are excited to open the restaurant, which will offer dine-in, carryout and delivery service. The restaurant held a soft opening Tuesday night. Tiffin resident Jacob Mowery, a former co-worker of Banks-Sherer’s, said the soft opening was successful. Banks-Sherer said several sandwiches were popular Tuesday. He said The Benchwarmer, a pastrami, coleslaw and french fry sandwich with provolone cheese, was one of the most popular. He also said The Gobbler, a turkey, stuffing and cranberry aioli sandwich; The Italian Hero, a capicola and salami sandwich; and the steak sandwich also received positive reviews. Banks-Sherer said he thought the build-your-own-burger option would be popular. He said the burger comes as a single, double, triple or home run, with a quarter-pound beef patty for each level. Banks-Sherer said a sandwich of the month would debut in two or three months. He said alcohol is not available now but will be added in the next few months. Banks-Sherer said combo deals are to be affordable. Most sandwiches are priced at $7-$8 and patrons can add a drink and 10 ounces of fries for $2.99. Bank-Sherer said deliveries are available within the city limits and some just outside of Tiffin. He said he and Miller are trying to achieve their dream and give back to the community. The restaurant employs about 12 people. For more information or to place an order, call (567) 268-9268.